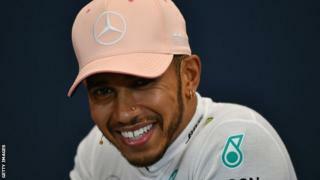 Lewis Hamilton's contract with Mercedes expires at the end of the seasonLewis Hamilton says it is "unlikely" his Mercedes team is one of Daniel Ricciardo's options for a potential move from Red Bull.Ricciardo, who won Sunday's Monaco Grand Prix, is out of contract at the end of the season and has been linked with moves to Mercedes and Ferrari.Hamilton said he "would imagine" Ricciardo's future was at Red Bull. "If at some stage Red Bull get an engine [closer in performance to Mercedes and Ferrari], they are going to be even closer to us. They could win many more races and he just has to keep his head down and keep doing what he's doing and he should have his options ready." Red Bull team boss Christian Horner said the team wanted to resolve whether they would be continuing with Renault or switching to Honda engines next year before trying to secure Ricciardo.Horner said he was waiting to see the performance of upgrades planned by both Honda and Renault for the next race in Canada, although insiders say Red Bull are all but decided on Honda from 2019.Horner said of Ricciardo: "He is now on the same amount of victories as Lewis and Sebastian six races into the season. Bahrain - he would have been a genuine contender there [had he not retired early in the race], and we know what happened in Baku [when the Red Bull drivers crashed together while running fourth and fifth]. "He is up to third and we have a very strong car. He has been the quickest driver. He knows the quality of the team. You can see how well he fits in the team and I'm hopeful we'll be able to move things along in the next couple of months. "On the engine decision, Horner said: "We are about a month or so away. End of June is the timescale we talk about. We are waiting with great interest to see the relative performance of engines in Montreal. "One hopes that makes it easier rather than harder. It will all depend on the data." Vettel is said by sources close to Ferrari to be pushing hard for the team to retain Raikkonen for next season.But Ferrari are taking their time and, along with Raikkonen, have the option of going for Ricciardo or promoting Monegasque Charles Leclerc, a Ferrari young driver who is impressing in his rookie season at Sauber this season.They will be wary of disrupting the team's internal dynamic by taking Ricciardo, who comprehensively beat Vettel when they were team-mates at Red Bull in 2014.However, they may be waiting to see how Vettel handles his title fight with Hamilton this season, after making crucial mistakes on the way to defeat last year. Their decision on Leclerc will rest on whether they think he has both proven enough to be promoted and is ready to make the jump to the intense pressure of Ferrari after just one season.If not, Leclerc is tipped to be promoted to the satellite Haas team, almost certainly in place of Frenchman Romain Grosjean, who has had a difficult start to this season.